T-Mobile Roaming 4G LTE now in Canada and Mexico! T-Mobile Plans Now Include High Speed Roaming in Canada and Mexico! I’ve written before about T-Mobile roaming as a my secret weapon for staying connected abroad. While I do get local SIM cards for my longer stays, their plans have been especially useful for my short stays or overnight layovers in foreign countries. As well, it’s extremely useful to have connectivity as soon as I land. On my trip last week which was only a week, I used over 500mb of data. At 0.10 cents/mb (a really cheap rate to roam with), that’d make me run up a steep $50 roaming bill if I wasn’t on T-Mobile. Although it was EDGE speed data, it still worked for webpages, maps, social media, and messaging fairly well. T-Mobile has just launched a new revamp of their plans, called Mobile without Borders. Starting July 15th, you will be able to use your 4G LTE Data and calls in Canada and Mexico. This usage will count towards your existing limits in the US. That is incredible. It takes away any advantage that using other prepaid mobile roaming solutions or local SIMs have — that being that those solutions have much faster speeds than T-Mobile. For people that live in and are travelling to Canada/US/Mexico, there is now nearly no reason why you should be using anything else to get mobile data for your phone. While the cheapest voice + data plan which qualifies for T-Mobile Roaming at EDGE internationally and now at 4G LTE in North America is $50/month, a useful trick to get roaming without paying quite so much is just getting the data plan, starting at $20/month. This still includes unlimited international roaming, as well as these new features in Canada and Mexico. While this does not include calls, you can easily substitute that with a VOIP alternative that simply includes data. 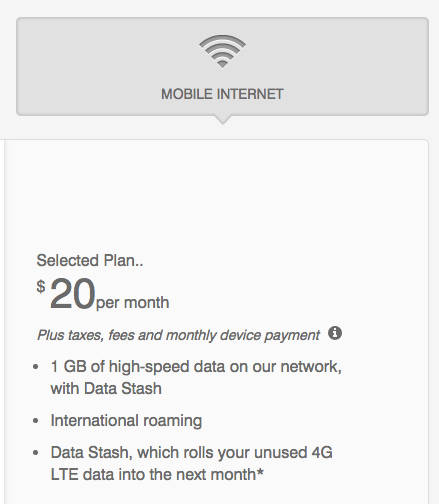 The kicker is that these plans are post-paid, where you pay after you use the service every month. Thus, you would need a US credit report as they will generate a hard pull to qualify you for this plan. Fortunately, even if you don’t have a US credit report, you might still be able to qualify for the high-speed data and calling in Canada and Mexico, as T-Mobile’s press release says these changes apply to all plans, including prepaid customers. The prepaid plan is the same price except it excludes international roaming. I just spent a half hour on the T-Mobile web site and I cannot figure out how to get a T-Mobile plan here in Canada. Can you get a T-Mobile plan as a resident of Canada?? Certainly not obvious on their web site. Like you, I would like to have cell phone service for short stays in various countries around the world. Sim cards take too much time for a short stay, but your T-Mobile solution may be the answer, if I could get an account. If you are a resident of Canada, you have to go in-branch to a T-Mobile store next time you’re in the States, an they can help you. I do not think you are able to start service online. are you sure this sim card be used on smart phone? I asked T-Mobile store today they said these sim cards will be used for tablet only so won’t work for smart phone. That might be what T-Mobile says, but I’ve been using their SIMs on my smartphone for close to a year. I am really interested in trying this. Can you provide more details how to make it work? I wan to get a tablet sim card from TM on $20 data plan for my Nexus 5 ( which is totally unlocked and has been activated on TM previously). From what I read, TM offers different sim card for tablet or smartphone and they won’t allow to switch between table and smartphone. What kind of phone do you have? I have an iPhone 5, which is unlocked. I activated my T-Mobile service over a year ago, so I can’t remember the exact process, but a store representative at a branch in the US could probably help you. I have the data only plan and I just stick the SIM in my phone, and it works. Do keep in mind, though that for the international roaming, it require a hard inquiry on a US credit report.